A Hardware Trojan (HT) is a malicious modification of the circuitry of an integrated circuit. A malicious chip can make a device malfunction in several ways. It has been rumored that a hardware trojan implanted in a Syrian air-defense radar caused it to stop operating during an airstrike, thus instantly minimizing the country’s situational awareness and threat response capabilities. In other settings, hardware trojans may leak encryption keys or other secrets, or even generate weak keys that can be easily recovered by the adversary. This article introduces a new trojan-resilient architecture, discusses its motivation and outlines how it differs from existing solutions. The full paper (Vasilios Mavroudis, Andrea Cerulli, Petr Svenda, Dan Cvrcek, Dusan Klinec, George Danezis) has been presented in several academic and industrial venues including DEF CON 25, and ACM Conference on Computer and Communications Security 2017. Judging from the abundance of governmental, industrial and academic projects concerned with the prevention and the detection of hardware trojans, there is a consensus regarding the severity of the threat and it’s not taken lightly. DARPA has launched the “Integrity and Reliability of Integrated Circuits“ program aiming to develop techniques for the detection of malicious circuitry. The Intelligence Advanced Research Projects Activity funded a project aiming to redesign the fabrication of integrated circuits, while various other initiatives are currently undergoing (e.g., the COST Action project on “Trustworthy Manufacturing and Utilization of Secure Devices” and the DoD Trusted Foundry program). In addition to these, there are numerous other industrial and academic projects proposing new trojan detection techniques every year, only to be circumvented by follow up work. But do Hardware Trojans exist? Ironically, until now there have been no cases where malicious circuitry was detected in military-grade or even commercial chips. With nothing more than rumors to hint about hardware trojans (in places other than academic lab benches), one cannot but question their existence. In other words, is HT design and insertion too complex to be practical, or do our detection tools fail to detect the malicious circuitry embedded in the chips around us? It could be that both are true: hardware trojans do not exist (yet) as malicious actors are focusing on other aspects of the hardware that are easier to compromise. In all cases where trojans were discovered, the erroneous behavior was traced to the chip’s firmware and not its circuitry. Interestingly, in the vast majority of those incidents the security flaws were attributed to honest fabrication mistakes (e.g., manufacturer failing to disable a testing interface). It is safe to always assume that an IC will fail in the worst possible way, at the worst possible time (see Syrian airdefense incident). This “crash n’ burn” approach is common in critical systems (e.g., airplanes, satellites, dams), where any divergence from normal operation will result in an irrecoverable failure of the whole system. To mitigate the risk, critical system designers employ redundancy techniques to eliminate single points of failure and thus make their setups resilient to faults. A common example are triple-redundant systems used in autopilots. Those systems employ three identical chips sourced from disjoint supply chains and replicate all the navigation computations across them. This allows the system to both tolerate a misbehaving chip and detect its presence. It is noteworthy, that those systems do not consider the cause of the chip malfunction, and simply assume that they fail in the worst possible way. Following from this, a malicious chip is not significantly different from a defective one. After all, any adversary sophisticated enough to design and insert a hardware trojan is capable of making it indistinguishable from honest manufacturing errors. Similarly, from an operational perspective it makes little sense to distinguish between trojans in the circuitry and trojans in the firmware as the risk they pose for the system is identical. 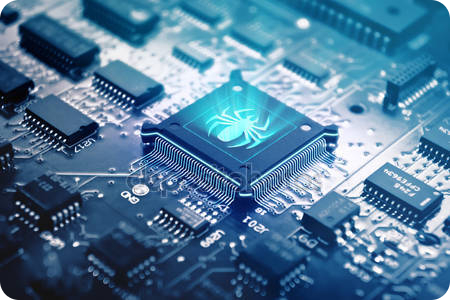 Given that it is impossible to achieve 100% detection rates of hardware trojans and errors, it is important that our devices maintain their security properties even in their presence. Our work introduces a new high-level device architecture that is resilient to both. In its core, it uses a redundancy-based architecture and secret-sharing protocols to distribute all secrets and computations among multiple chips. Hence, unless all chips are compromised by the same adversary, the security of the system remains intact. A key point is that those chips should originate from disjoint supply chains. This is to minimize the risk of the same adversary compromising more than one chips. To evaluate its practicality in real-life applications, we built a Hardware Security Module (HSM) that performs standard cryptographic operations (e.g., key generation, decryption, signing) at a very high rate. HSMs are commonly used in operations where security is critical, and an increased transaction throughput is needed (e.g., banking, certification Authorities). A demonstration is shown in the video above, and further details are on our website. Finally, our work can be easily combined with all existing detection and prevention techniques to further decrease the likelihood of compromises. Next Next post: Thinking about fake news – As a security incident?